Seismic waves ripple out in all directions from the point where the earthquake occurred. As the waves move, they carry energy through Earth. The waves can travel from one side of Earth to the other. Seismic waves include P waves, S waves, and surface waves. Some seismic waves are longitudinal waves. Longitudinal seismic waves are known as P waves, or primary waves. They are called primary waves because they move faster than other seismic waves and so arrive at distant points before other seismic waves. P waves are made up of compressions and rarefactions of rock inside Earth. These waves compress and expand the ground like a spring toy as they move through it. Other seismic waves are transverse waves with crests and troughs. Transverse seismic waves are known as S waves, or secondary waves. S waves shake the ground up and down and side to side as they move through it. They cannot travel through liquids. 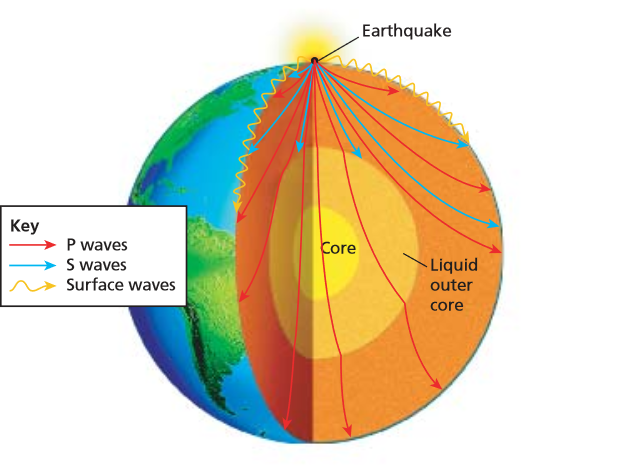 Because part of Earth’s core is liquid, S waves do not travel directly through Earth like P waves. Therefore, S waves cannot be detected on the side of Earth opposite an earthquake. Scientists on the side of Earth opposite the earthquake detect mainly P waves. When P waves and S waves reach Earth’s surface, they can create surface waves. A surface wave is a combination of a longitudinal wave and a transverse wave that travels along the surface of a medium. Surface waves produced by earthquakes move more slowly than P waves and S waves. However, they can cause the most severe ground movements. They combine up-and-down and side-to-side motions, making the ground roll like ocean waves. Earthquakes that occur underwater, like the one off the coast of Chile in 1960, can produce huge surface waves on the ocean called tsunamis (tsoo nah meez) . Tsunamis come in all sizes, from 2 centimeters to 20 meters tall. They can travel thousands of kilometers across the ocean.